Pan-fried king prawns served with slow cooked leeks and a creamy spinach sauce. Rinse the spinach and then place in a colander and allow the water to drain away. Wash the leeks and then cut into thin strips. Snip the chives. Remove the stalk from the tomatoes and cut a small cross into the base of each tomato. Bring a large pan of water to the boil and then blanch the tomatoes for 10 seconds. Refresh in cold water and then remove the skin. Cut the tomatoes into quarters, scoop out the seeds and then cut the tomatoes into small dice. Heat a little oil in a saucepan and then add the leeks. Cook until the leeks begin to soften and then add the white wine to the pan. Allow to reduce for a few seconds before adding a glass of water. Cover and simmer for 10 minutes. Bring a large pan of water to the boil and then add the spinach leaves. Blanch for a few seconds before refreshing in cold water. Remove from the cold water and drain. Mix the cream into the spinach and then season with salt and pepper. De-shell the prawns and remove the black spine. Season with salt and piment d'Espelette. Heat a frying pan to hot and add a drizzle of olive oil. Add the prawns to the pan and cook for 3 minutes. Remove the lid from the leeks and cook until all of the liquid has evaporated. Season with salt and piment d'Espelette. 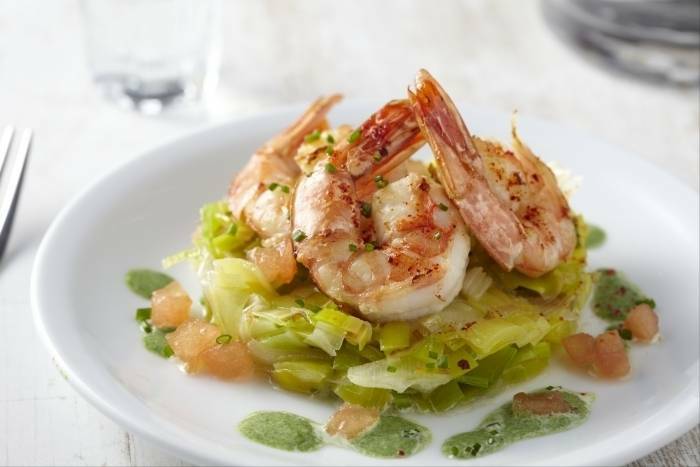 Serve the prawns on a bed of leeks and dress with the creamed spinach and fresh tomatoes. Sprinkle the chives on to the dish to finish.